Buddha is located on the top of the hill over looking Villa de Leyva. It's absolutely beautiful at night. A bit hard to get to if you don't know where your going. Great staff and very clean. Such a cool town with a lot to do! You're missing out if you choose to skip this place! One site said, "the perfect backpacker town.. just with out the backpackers." More people really should come here! And this hostel is absolutely awesome. The staff is sweet, the bonfires are huge, the view is great but still not too bad of a walk from town. We formed a nice little group here. It was a lovely week I spent here. Great hostel with a very relaxed vibe. Nice to have a fire at night and to play with the dogs. Showers weren't always hot. It was a beautiful location, waking up to the scenery in the morning was something spectacular. Israel was particularly helpful and accommodating. Perfect place for a getaway from the city’s. We stayed in one of the dorm rooms for 3 nights. Aside from some discomfort related to the beds, this hostel was excellent. The staff (especially Israel) were extremely friendly, the food was delicious and reasonably priced, and the view was spectacular. Most nights they throw bonfires and sometimes hand out free popcorn. The atmosphere is very laid back, with two fun dogs and a kitten running around. I would highly recommend this hostel, just be mindful it is a little far from the bus terminal. Seems like a decent place, I didn’t spend much time here. I was there during the week and it was almost empty, no atmosphere. 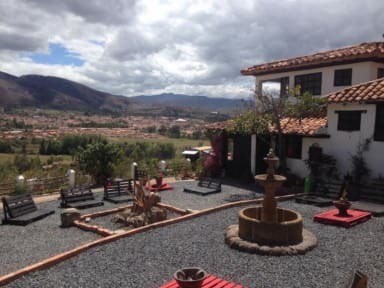 Amazing view of Villa de Leyva! We stayed just one night. The staff was friendly but could hardly speak English so it was difficult to communicate. The hostel is located about 30 minutes walk from bus terminal uphill. The view is nice and it’s a great place if you just want to relax but it’s not very comfortable. The kitchen is not well equipped (we only found two plates) and the fridge was not very clean. We slept in the dorm (extension of the building) and it was quite cold. The hostel has a great atmosphere but the infrastructure is not good. There is just 1 bathroom ( 1 toilet+shower) per floor and the water in the shower didn't have enough pressure. Our room had a lot of dust and I am allergic then I didn't pass a good night. 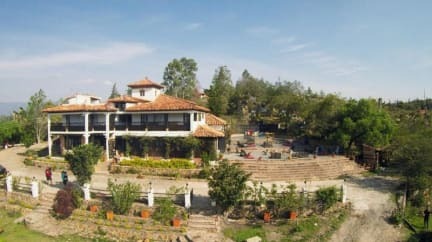 The hostel is 25 minutes walking, through a dirt road without good ligth, from the downtown. the staff was very kind. No door security, no room key, no lockers in room, just lockers in the hallway. They have no controll at all who goes in and out. The beds we slept in were in bad shape. Bedsheets were missing on check-in. There was bacon in the veggie-omlette. People party all night with loud music! Night silence is not enforced. I had to get up at 02:30 to tell them to stop the music. Hot showers were hard to get - because of missing preassure and heating. Slow Wifi @0.2Mbit.